To treat the whole patient, you need the whole picture—leverage Phreesia to collect self-reported social needs at scale. Patient activation, EHR integration, and analytics differentiate our solution. The problem we solve: As risk-based contracts expand and incentive structures change, providers are under increasing pressure to manage the social and medical care of vulnerable populations. Providers need a scalable solution that enables them to both proactively identify and address individual patients’ social determinants and simultaneously will give them valuable insight into their community’s top needs. While there are some health IT solutions in the market today that help match patients with community resources, they lack an ability to effectively identify the right patients in the first place. About our solution: This year, Phreesia will check in 85 million patients to ambulatory clinics across the country. 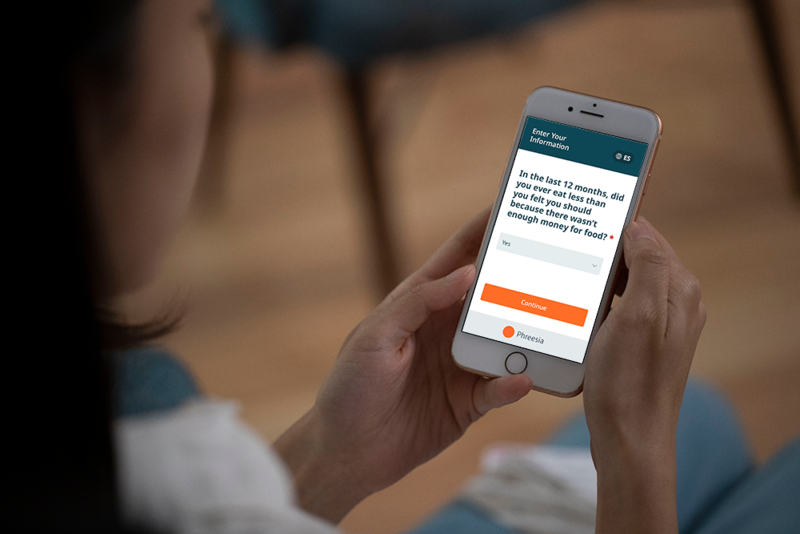 Phreesia’s SDOH product leverages our digital intake platform, using dynamic logic to screen patients and automatically identify those with urgent, self-reported SDOH risks. We engage patients at a critical time when they are already seeking care and primed to speak with a provider about their health needs. As part of this process, we alert providers of patients’ needs and facilitate outreach performed by care coordinators, allowing them to track follow up and outcomes for individual patients. Finally, we offer in-depth analytics on the screening results to help practices meet reporting requirements and simultaneously derive insights about how to better support their community. Founded in 2005, Phreesia is the nation’s leader in patient intake. We work in all 50 states, across over 30 specialties, and will see approximately 85 million unique patients in 2019. Additionally, we integrate with the leading PM/EMR systems including: Allscripts, athenahealth, Cerner, e-MDs, Epic, Greenway Health, NextGen, and Virence Health. As part of our standard intake process, we already collect millions of SDOH patient records each day. Given our proven success helping practices collect and report on this sensitive health information in a secure manner, we have begun developing a formal SDOH product offering that enables practices to support patients’ SDOH needs in real time. We are fortunate to be partnering with two leading health systems in the US that are participating in our SDOH beta program. We have also received significant interest in our SDOH offering from the rest of our client base, including 160 clients who participated in our recent SDOH webinar. Bio: Hilary Hatch, Ph.D is a clinical psychologist and VP of Clinical Engagement at Phreesia. Dr. Hatch was formerly founder and CEO of Vital Score (recently acquired by Phreesia), a digital health company focused on motivating patients to self-identify and self-refer for unmet social and behavioral needs through technology in primary care. Dr. Hatch is an Instructor at the Johns Hopkins School of Medicine where she is a member of the Center for Innovative Medicine. Dr. Hatch is a frequent contributor to The Health Care Blog and invited speaker on patient engagement including AVIA Innovation, Health Management Academy, University Health Systems Consortium, Deloitte Healthcare Innovation, Junto Health and HIMSS. Dr. Hatch participated with 30 nationally recognized leaders to propose recommendations for the advancement of Patient-Reported Outcomes (PROs), published in the Journal for Managed Care and Specialty Pharmacy. Biography: Liz Fox is a Director of Analytics and Insights at Phreesia, where she has worked for the last 3 years. She focuses on Phreesia’s research and evaluation which includes leading the Social Determinants of Health initiative. Liz holds a BBA from The George Washington University in Finance and Economic Policy as well as a Masters in Public Health from the University of Pennsylvania. Biography: Carrie Wolf is a member of the Product Marketing team and oversees the go-to-market strategy for Phreesia’s patient activation products. Prior to joining Phreesia, she worked at Advisory Board (Optum) doing research and consulting for hospitals and health systems across the country. Her focus was in service line growth and technology investment strategy. She also spent time working in health policy at the National Academy of Medicine and The Dartmouth Institute for Health Policy and Clinical Practice. Carrie holds a BA in Environmental Studies from Dartmouth College. Many patients have personal needs that they don’t always feel are relevant to bring up with their healthcare providers. On our secure platform, patients have the opportunity to self-identify sensitive social needs privately before their visit. They are primed to be honest and open with their provider about personal needs that impact their overall health and well-being. Phreesia has deep expertise in screening patients about sensitive health information including tobacco, drug, and alcohol use; depression, anxiety, and other mental health conditions; insurance status; and physical mobility and functionality. As a result, providers are more likely to address individual patient’s needs during the visit or offer referrals, while the patients are activated to talk to their provider and access the resources provided. Phreesia helps providers better understand the whole picture so they can treat the whole patient. Phreesia provides an automated intake platform while delivering an individualized experience for each patient. Practices gain capacity to do more of what matters at their organization, driving quality performance and standardization, without compromising a great patient experience. We know that every patient who walks through the door is unique—and so are the needs of each healthcare organization. Whether it’s a single specialty practice or large health system, Phreesia allows providers to implement SDOH screening and intervention without imposing a disruptive new workflow, adding new staff, or increasing length of visit time. Leveraging our existing intake workflow, staff increases the likelihood of success of an SDOH initiative. Phreesia has expertise with health systems and the complex challenges they face. From participating in risk-sharing agreements like ACOs to managing different EMR systems, they need a comprehensive solution that meets the needs of their enterprise. Our platform provides a consistent, modern experience across a wide range of specialties and settings. Whether they’re looking for new ways to improve population health, working to lower costs, or just trying to run a more efficient health system, Phreesia can help. Phreesia collects patient data at scale, empowering providers and partners with the information they need to deliver care most effectively. Simultaneously, our digital data collection process, including integration with partner organizations, minimizes time-consuming, manual data entry thereby creating more time for staff to focus on patient care. For partners in the marketplace who match patients with resources, we provide an automated solution to identify and activate patients at scale necessary for the resource matching process. Our product helps healthcare organizations collect standardized patient-reported SDOH data at scale as part of an effort to better understand unmet needs and gaps in care and address them at both the individual and community level. In December 2018, over one million patients checked in with Phreesia in the Gulf States, 55,000 of which took place in Louisiana. By participating in this challenge, we hope to partner with providers in New Orleans who are passionate about addressing social determinants of health in their community and want to use Phreesia’s product to support them. Each year, millions of patients report sensitive information about their social needs using Phreesia, including answers to specific SDOH questions. Early advances in our SDOH product include creating real-time alerts for staff so that they can address the social and medical needs of patients, patient-facing resource guides enabling patients to serve as their own advocates, and analytics that surface top needs in the community. In our next phase of this project, our objective is to better support patients in accessing the resources they need and relieving the burden of follow up for providers. To do so, we must build APIs to technological solutions that will support patients with risks in each domain. At Phreesia, we realize how uniquely positioned and privileged we are to connect with patients before, during and after their visit to their provider. We have made it our mission to know patient intake and to help healthcare providers better understand their patients. We do whatever it takes to engage patients in their care. Whether we are screening for social determinants of health, identifying patients at risk for falls or signing up Medicare patients for annual wellness visits, we want to make a difference.